A detail of the water-side porch shows the doors to the kitchen. 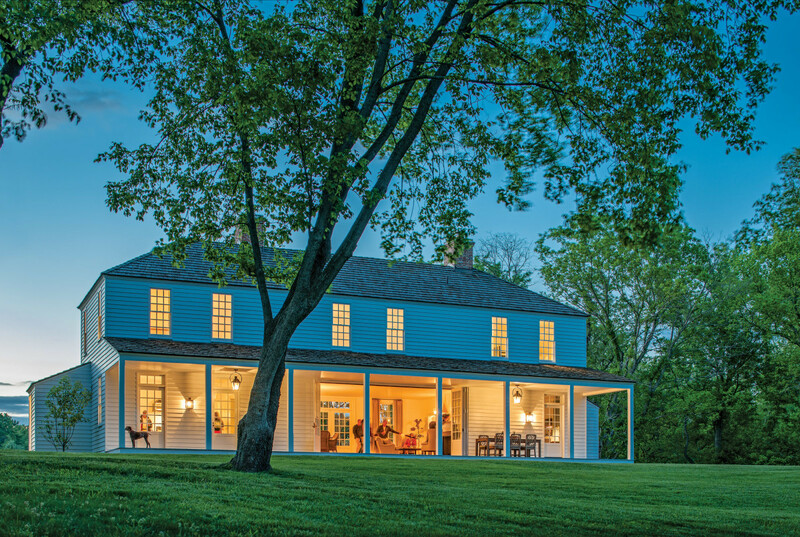 Like a Colonial-era sentinel, the Shaker-simple farmhouse makes a striking statement. 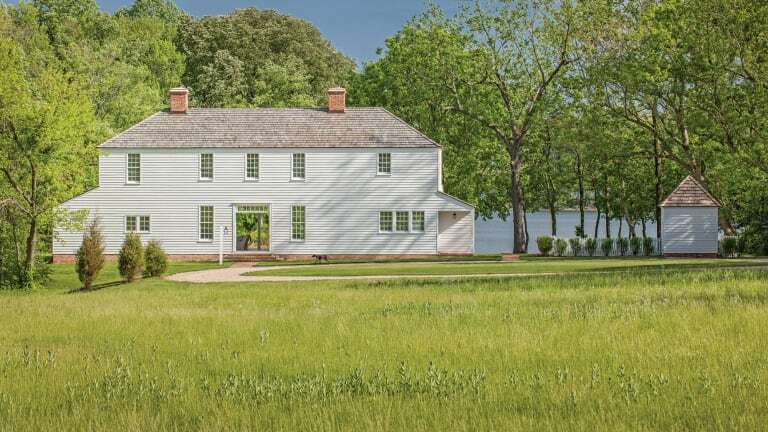 Gazing out at the water, it looks as though it has been planted in the same spot for centuries just like the oak and sycamore trees that shade the 60-acre property. But the snow-white wood-sided house harbors a dark secret: It has always lied about its age. The relaxed weekend retreat of Richard and Amy Zantzinger and their two children was built less than a decade ago. 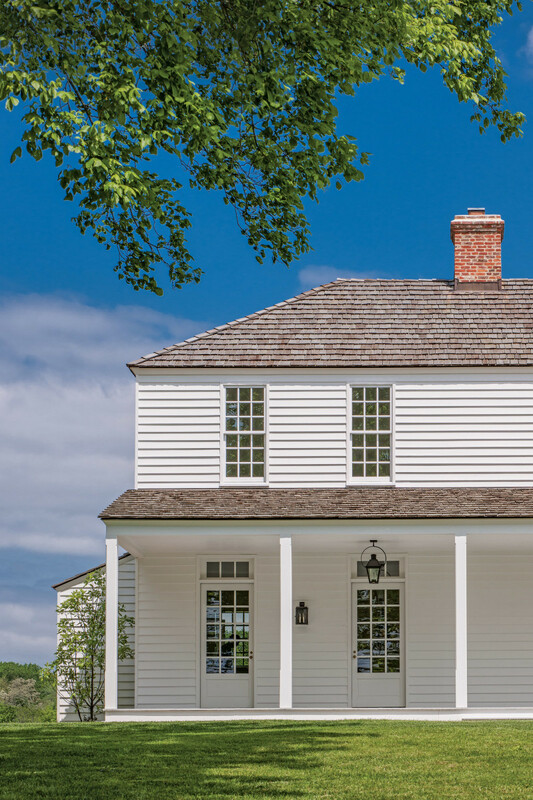 Architect Wouter Boer of Jones & Boer Architects in Washington, D.C., who was the principal in charge and lead designer for the project, took his inspiration from the neighboring farmhouses, many of which date to the 1700s. “They wanted a house that took advantage of the views and that wasn’t too large,” says Boer, AIA. The Zantzingers—Richard’s a contractor and Amy’s an interior designer—and Jones & Boer Architects have done many projects together for a variety of clients. 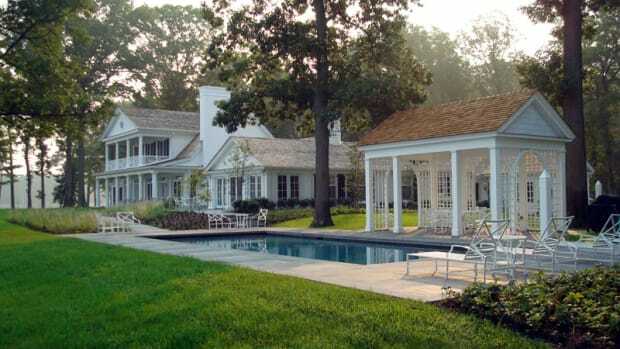 A traditional-style rectangular swimming pool lies at the side of the house; a brick path from the porch leads to it. 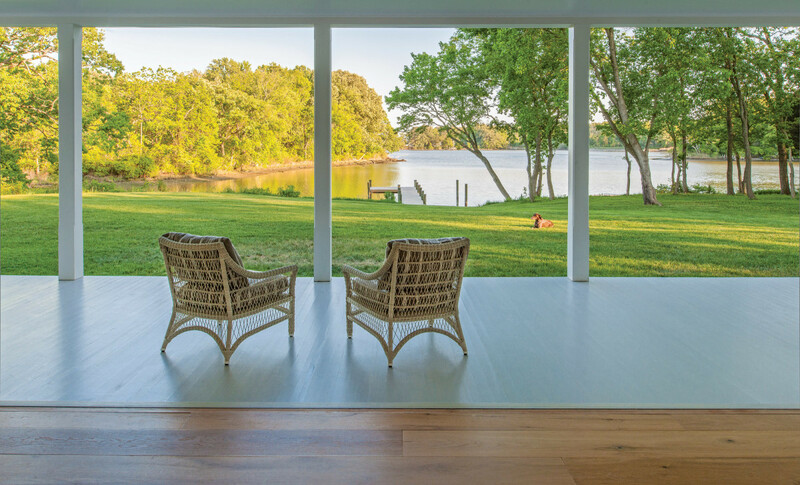 The 4,300-square-foot structure, sited on farmland on the West River that feeds into the Chesapeake Bay, is reached via a long approach that passes through a pair of paddocks. A loose lasso hoop of a driveway, paved in crunch-under-the-tires oyster shells, leads to the front doors. When they and the back doors are open, there is a clear-through view to the water. 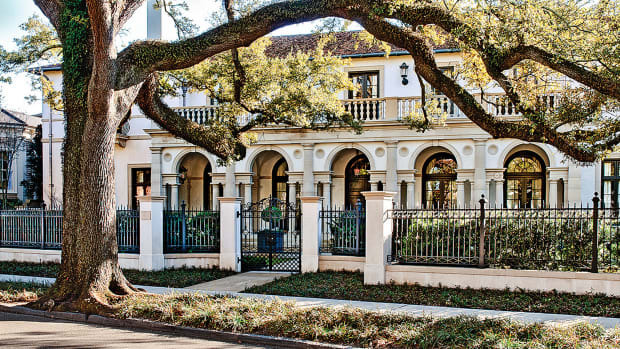 Boer and the Zantzingers imbued the house with history by using traditional materials that beautifully look their age. The red brick of the foundation and off-center chimneys, for instance, is reclaimed from a history-laden building in Baltimore, the roof is clad in wood shingles and the proportions of the new window panes are identical. A pair of chairs, lounging on the pillared porch, take in the placid, panoramic view of the West River. A series of bi-fold doors, whose mullions match the rest of the fenestration, on the pillared porch blur the boundaries between the river and the land. In the living room/dining room space, which is decorated with casual and comfortable period-style furnishings by Amy Zantzinger, bi-fold doors open to the water. 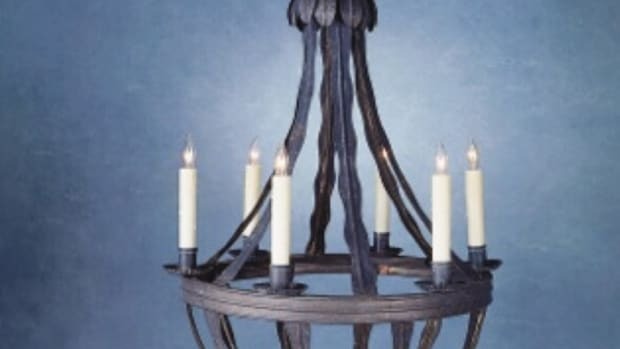 The mantel, the centerpieces of the space, is plaster with a stone surround. The Zantzingers’ boating buddies ride or sail into the dock, and their car-driving friends get a feel for the house as portions of the rooms reveal themselves through the home’s windows as they pass by. Although a previous pre-fab house in a different spot was torn down, the Zantzingers acquired a 1700s wood-frame and brick-foundation cottage from their neighbors and converted it into a guesthouse. Inside, Boer created simple architectural elements, such as the plain plaster fireplace and stone surround in the living room/dining room space, the Shaker-style cabinets that line the kitchen walls and the hallway staircase, which is an object of elegance.In the kitchen, Shaker-style cabinetry and a farmhouse dining table keep things simple yet contemporary. In the kitchen, Shaker-style cabinetry and a farmhouse dining table keep things simple yet contemporary. 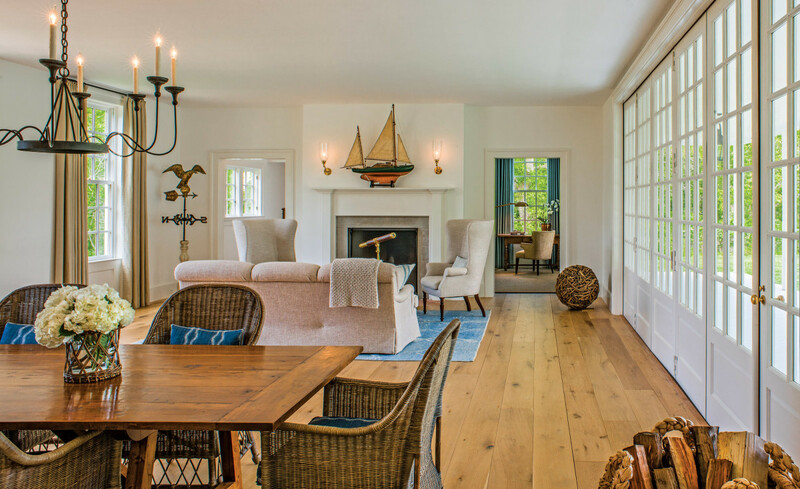 Amy, an interior designer, chose the furnishings, which include the wooden sailboat on the living room/dining room mantel that had been Richard’s boyhood toy and the wooden farmhouse table where the family gathers for meals. Boer says that aging the house was more about subtracting details than adding them. 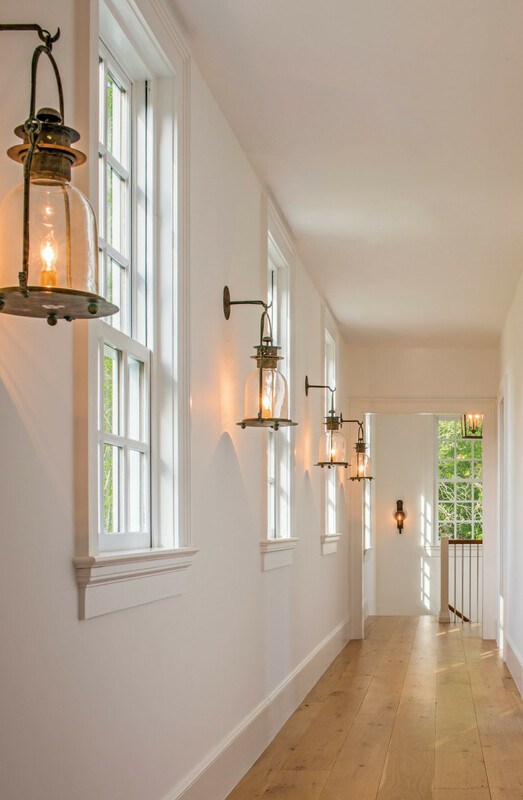 Period-style electric lanterns add charm to the second-floor hallway, where the bedrooms are. He’s proud of the fact that he used standard products—brick, wood siding and windows—rather than elaborate custom items to create architectural authenticity. The Zantzingers couldn’t agree more. The couple, whose primary residence is a 45-minute drive away in Chevy Chase Village, find that they are spending more time than they anticipated at home they call simply The Farmhouse. “They come several times a week,” Boer says, adding that he understands why they find it difficult to stay away. At night, the water side of the farmhouse becomes the center of family activity.